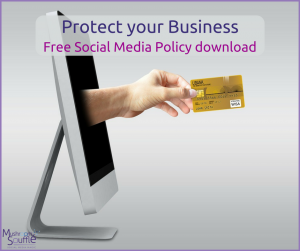 Protecting your business with a Social Media Policy is something that can potentially save you thousands of pounds. Why? Because social media is a complex subject on it’s own, when it merges with another business requirement – Human Resources – things can become increasingly problematic. I discovered this rather vital and shocking information from Leah Waller of Lennons Solicitors at a NatWest workshop on protecting your business. Of course, I have my reasons for why businesses must have a social media policy in place. These views are from a social media mentoring/coaching point of view, which until recently didn’t include solid LEGAL HR reasons! You are never too small for a social media policy! It doesn’t just apply to employees. As a sole trader, you may still have contractors, associates and freelancers. But, and I need to stress this, if you have the one employee – GET A SOCIAL MEDIA POLICY! It means everyone is clear on the expectations of online behaviour. “There are minimal legal requirements on employers to have specific written policies and procedures in place and so most employers see this as a mere matter of good practice rather than necessity. However, there are instances in which a written policy, although not compulsory, can give the employer significant legal protection. Small businesses can still conduct themselves as if they are a much bigger company, what is the worst that can happen? Policies and processes are implemented that will assist your business to grow and protect it while it does! Policies don’t have to be pages of complicated wording to instill the requirements. Clarity is key! Take a look at Coca-Cola’s online social media principles. The document is short and to the point. It is possible they may have a slightly more in-depth document that is only for internal use. I like the fact that Coca-Cola uses their values to make a commitment to how the company will conduct itself online. They make themselves accountable. How many businesses publicly do that? Coca-Cola clearly lays out the behaviour it requires from both company spokespeople and the general public. Too many businesses are trying to implement social media without providing their team with the appropriate training, but that’s a subject I’ve already taken on in a previous blog. What this all comes down to is this; Coca-Cola takes their social media marketing and reputation seriously. Be like them. Always remember that most of what you publish on Social Media sites is public, whether you intend it to be or not, so use your common sense. I am always surprised by the number of issues I see because of social media. If you have advised your employer that you are absent from work due to illness it is probably best to steer clear of uploading photos of you having fun in sun on your social media sites – sounds like common sense but it happens! With the increased use of Social Media sites such as LinkedIn, it can become difficult to distinguish who are your personal contact and who are ‘clients’ and/or ‘contacts’ of your employer. A Social Media Policy will help define this and also what should happen in relation to these contacts following the termination of an employee’s employment. Consider whether, as an employer, you would want new staff commencing work with you and adding all of your client database to their LinkedIn account and then moving on from employment with you to a competitor and having access to all of those contacts through their own LinkedIn account. This may be particularly relevant in sales roles. (LinkedIn is an example here. This could just as easily apply to any other Social Media site). Having a Social Media Policy for your business is not a complicated task. And now it is even easier! Courtesy of Lennons, here is a free download of their Social Media Policy template. This is the template that they customise for their customers. Use this and inspiration from Coca-Cola to devise a Social Media Policy to suit your business and protect it. For a professional conversation on how to protect your business, content Leah Waller on leah.waller@lennonssolicitors.co.uk. Lennons Solicitors are experienced commercial lawyers based in Chesham and Amersham, Buckinghamshire. Follow them on Twitter and LinkedIn.